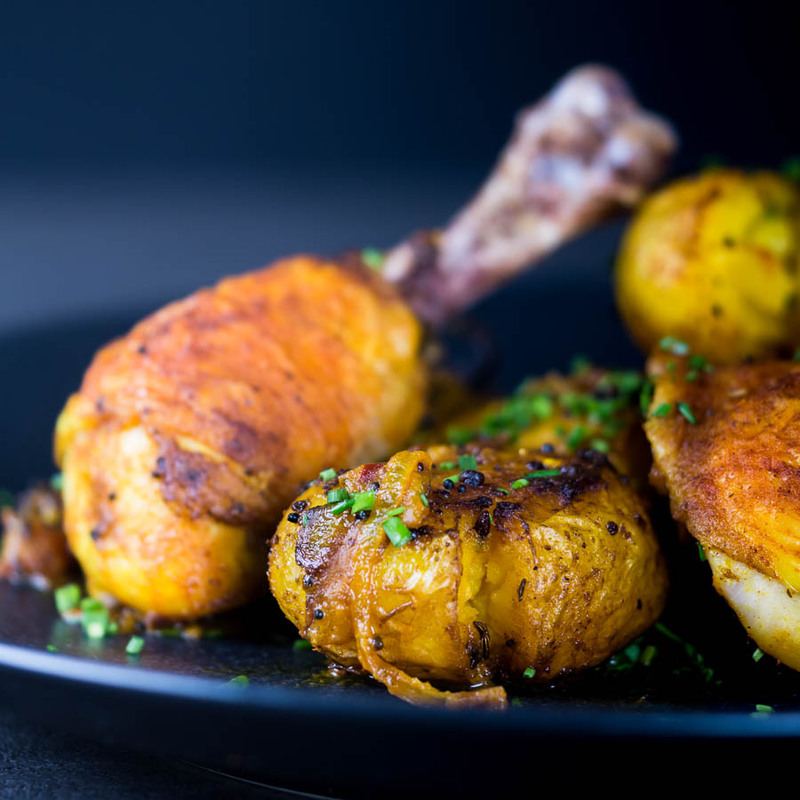 Bombay potatoes or Bombay Aloo are the perfect side dish to these simply roasted spiced chicken legs, spiced with Indian flavours in a dish that is not Curry. 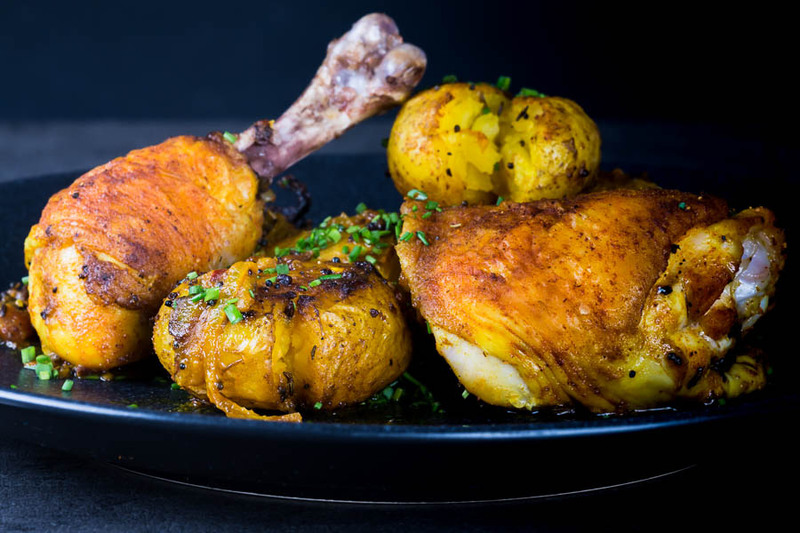 Bombay Potatoes With Chicken Legs. I’m probably, ok definitely, as guilty as many people as my heavy associations between Indian food and Curry recipes. 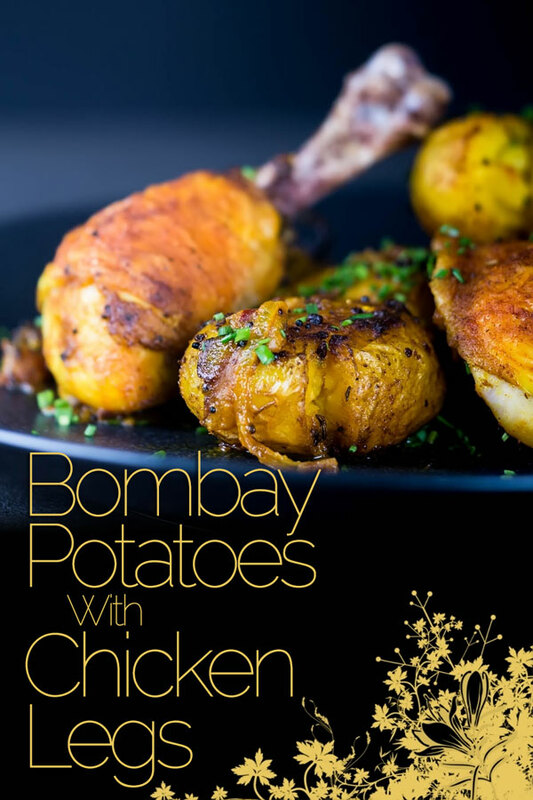 This Bombay potatoes recipe along with my recent Tandoori Fish recipes go some way to address that. Also known as Bombay Aloo, it is often assumed that Bombay Potato represents some form of Anglo Indian fusion. However, potatoes were introduced to India in the early 17th century by the Portuguese. Written reports of potatoes at Indian banquets date back as far as 1675. So whilst this may not have been called Bombay potatoes it is fair to assume that the idea is pretty ancient. This is not the only Portuguese influence on Indian food either. The much vaunted Vindaloo Curry is actually an Indian take on Portuguese dish. Anyway enough of the history lessons. These potatoes are heady with the fragrant spices of North India and just a hint of chili. 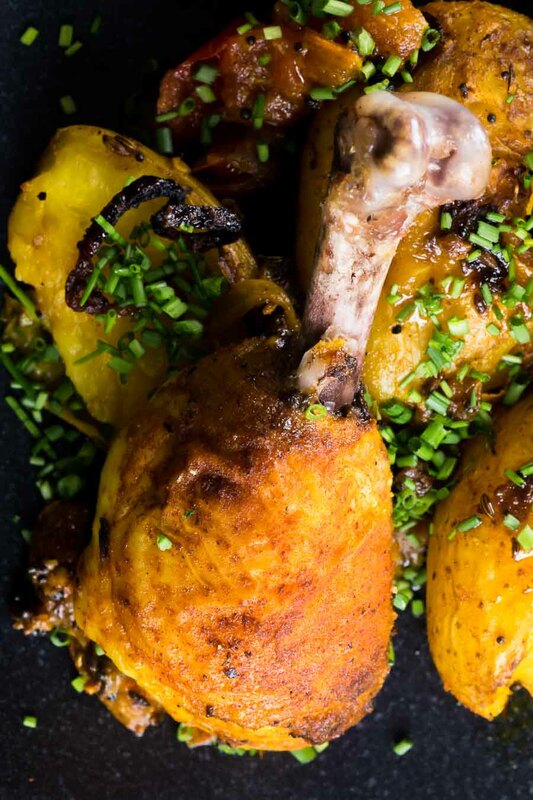 The chicken legs they are cooked with add flavour to the pan they are cooked on. Which naturally transfers to the potatoes in the final toss. How To Cook Bombay Potatoes. I have seen Bombay Potato recipes that vary from a wet curry all the way through to fairly ‘dry’ dishes. I prefer the latter! My version involves parboiling potatoes first with dried chili to get a little background heat. But the most important reason for this is so that they can be lightly crushed. Why is the crushing important? Well because that allows the crushed edges to go crispy when roasted in the oven of course. As a Brit crispy bits on roasted potatoes are somewhat of an obsession! Then it is a simple case of frying off some classic North Indian Spices like cumin, fenugreek, fennel, and fenugreek and ghee. Before roasting in the oven and then tossing before serving. Then adding some tomatoes and onion, feel free to add garlic and ginger if you wish, but for me, they are not required. What Are The Best Potatoes For Bombay Potatoes? As far as I am concerned the perfect spud for Bombay aloo is a small waxy salad potato. Most specifically I do not want my potatoes to break down when cooked and not have that fluffy texture. It is a personal thing, you can, of course, experiment with any old potatoes you fancy having a play with. I personally think that the structure of salad potatoes like Charlotte or Jersey Royals is a perfect vehicle for Indian flavours. If you wanted to make a wetter curry then maybe consider a more floury potato. They will add starch into the gravy and thicken it, perfect if you making a main course Bombay Potato Curry. It is a texture thing I think, and I use them in both my Aloo gobi and Saag Aloo recipes. What can I say, I like potatoes, I like curries… And as far as I am concerned potatoes are an incredible vehicle for flavour. It kinda makes sense that potatoes in Indian food work so well! 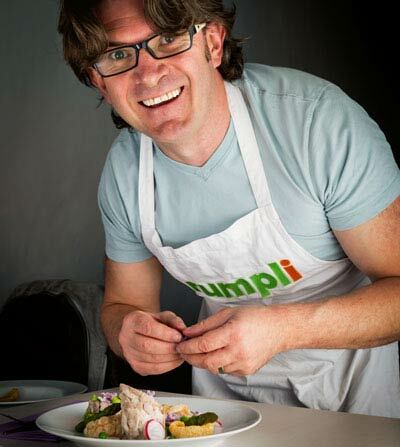 So go ahead get your Krumpli on and add some spuds to your Indian food, you are in good company! Bombay potatoes or Bombay Aloo are the perfect side dish to these simply roasted spiced chicken legs. Spiced with Indian flavours in a dish that is not a Curry! Mix together the seasoning for the chicken legs and then thoroughly dry your chicken legs before rubbing in the seasoning. Bring a pan of salted water to the boil and throw in the dried chili and potatoes and boil for 15 minutes to soften. Heat the ghee in a pan and add the seeds for the potatoes. Thinly slice your onions and when your seeds start to pop add in the onion and curry leaves then cook for 10 minutes. Drain your potatoes making sure you reserve the chili. Lightly crush your potatoes, you do not want the squished just broken open a little. Chop the chili and dice the tomato. Add in the turmeric to the onions followed by the chili, tomato, and crushed potatoes and toss to coat. Nestle in the chicken legs, I like to portion mine into drummers and thighs. Roast at 200°C or 400°F for 30 minutes, covering with foil nearing the end of the cooking process if things are catching. Serve sprinkled with lots of chives. I’m short of Fenugreek here in Thailand But I’m going to go for it this week. Would you have a recommendation for a replacement ? Difficult because Fenugreek is so distinctive. PS. Those moving pictures were a bit scary at first haha !!!! Haha. I personally think that Fenugreek is very difficult to substitute… I have read that a combination of mustard seeds and fennel seeds toasted off and then ground does an ok job although I am a little skeptical. Many Indian curry powders contain fenugreek so you could play around with the balance of seeds and add a little curry powder that you like, although make sure that curry powder is fresh as it loses its flavour really quickly. The great thing about Indian food is that you can be driven by your nose, I use a sense of smell to work out when the balance is correct when I start a new Indian recipe and then tweak from there. If you really can’t get it then omit and increase the mustard which will change the flaovur but will still taste great! Looks like a great dinner recipe for a busy weeknight. My family is sure to love it. lol, it is bizarre how the availability of ingredients vary around the World, I do not struggle to get any of the ingredients I use in Hungary which genuinely is the land that food progress forgot. I do have to go to a big city for supplies though. I love all the seasonings going on here, especially the fennel and the cumin. Yum. Two of my favourite spices. 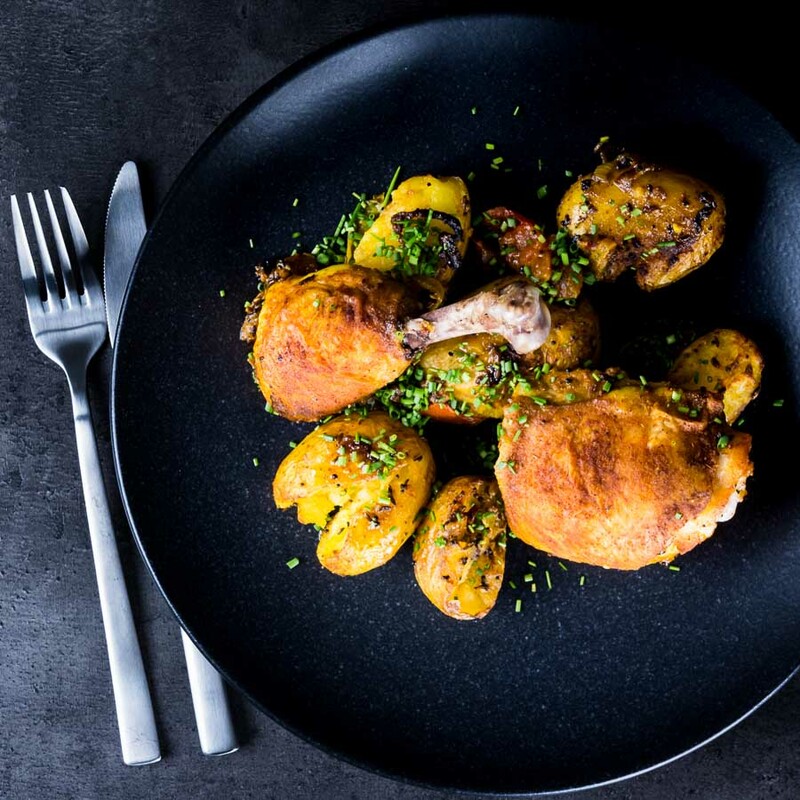 Loving the combination of Bombay potatoes with chicken, that really makes a whole meal of it and your photos are making me super hungry. Such a great idea!